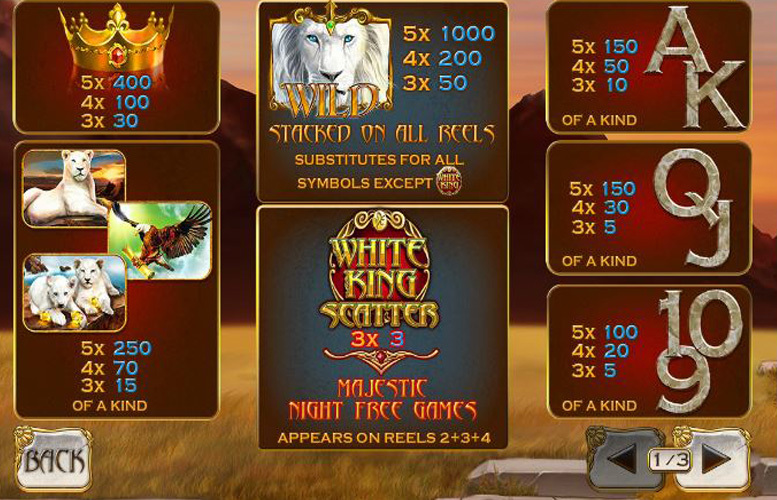 At first glance, the White King slot machine from Playtech looks like it might be a winner. There’s some beautifully illustrated symbols, and the background is also tastefully designed. However, a quick look at the pay-out percentages, the top jackpot, and the distinct lack of special features, and it becomes apparent that the nice artwork is just about all the title has going for it. In terms of specifics it has five reels, four rows, and forty win lines. The main game jackpot is just 1,000x the line bet, and by contrast, the highest possible wager per spin is a sizeable £2,000. High rollers are therefore well-catered for on White King, if they can get passed how incredibly dull the gameplay experience is. Great for high rollers. The top bet of £2,000 per spin is ideal for those with huge bankrolls who want to wage the most possible on slot machines. Fantastic art style. The game’s symbols and background have been thoughtfully illustrated and the animals are almost alive with their hyper-realistic illustrations. Very limited features. There’s only really the Free Games to get excited about and they don’t even have a multiplier or similar gameplay-enhancing addition. Low main game prizes. 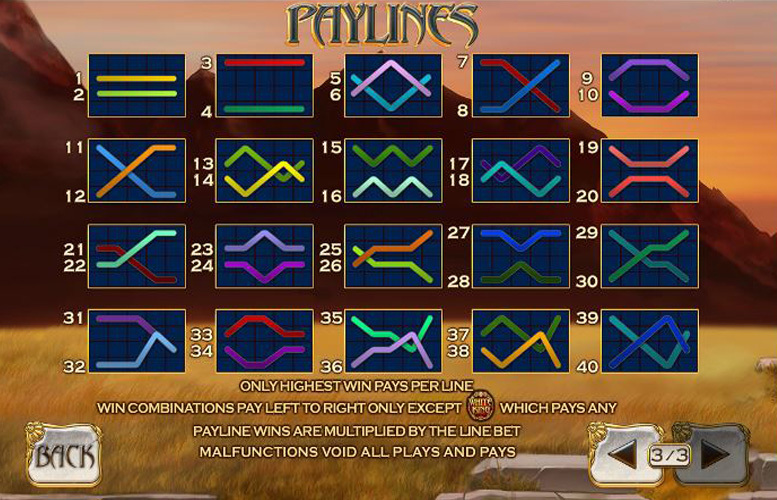 The top jackpot of just 1,000x the line bet seems small when compared with those games that offer 10x that figure as their ultimate pay-out. Ridiculously low return-to-player rating. Being just above 90% really isn’t great, particularly when compared with the 97% of some of White King’s peers. White lion (“wild”) = 1,000x the line bet. Crown = 400x the line bet. White lioness, white lion cubs, or eagle = 250x the line bet. Unfortunately, White King’s features are somewhat limited when set against its peers. Although we’ve listed two here, it’s fair to say that the only real bonus is the Majestic Night Free Games mode. 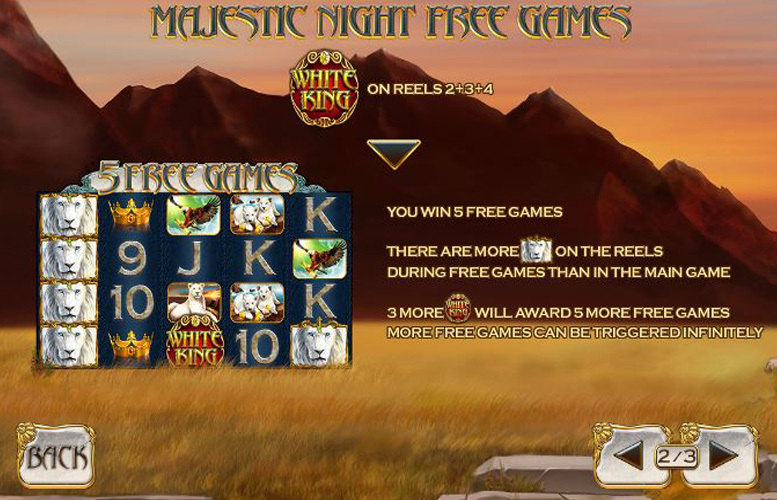 Landing the White King game logo on reels two, three, and four simultaneously will trigger five free games. During these, there are additional white lion symbols on the reels. If players are fortunate enough to land three more game logos on the same reels, they will receive an additional five free games. This dynamic can occur infinitely too. The game’s “wild” symbol is the majestic white lion. He appears stacked on all reels, in both the main game, and free spin mode. Queen, or Jack = 150x the line bet. 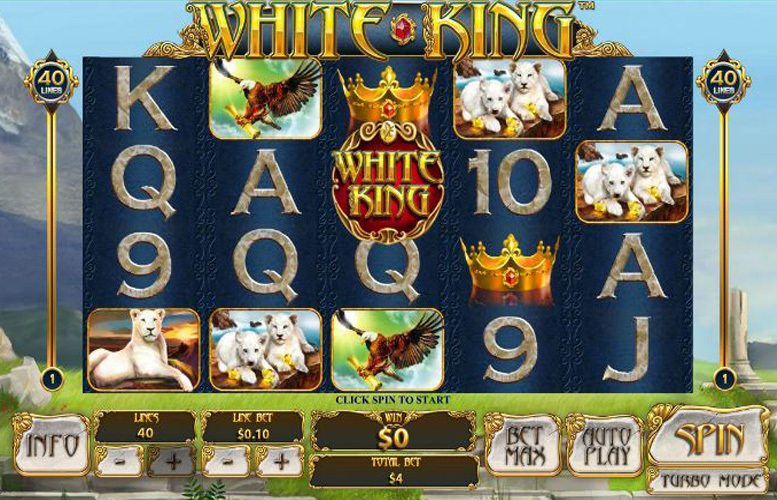 Players can adjust the number of win lines and the amount bet on each on White King. They can choose between one and 40 lines, and bet between 1p and £50 per spin. This means that the maximum possible bet per spin is £2,000 and the minimum is just 1p. Although White King has a great look and feel, it’s not that exciting of a title. It lacks sufficient bonus features to make it really stand out in the already overcrowded and competitive world of slot machines. With its singular side game, it can’t get close to the excitement of many of its peers. What’s more, White King operates at a return-to-player rating of just above 90%. This is incredibly low in the industry, and seems most stingy for a game with so little else going for it. This game has a rating of 3 / 5 with 351 total reviews by the users.